Always difficult what to say about oneself. So let’s start off with what’s important to me…. 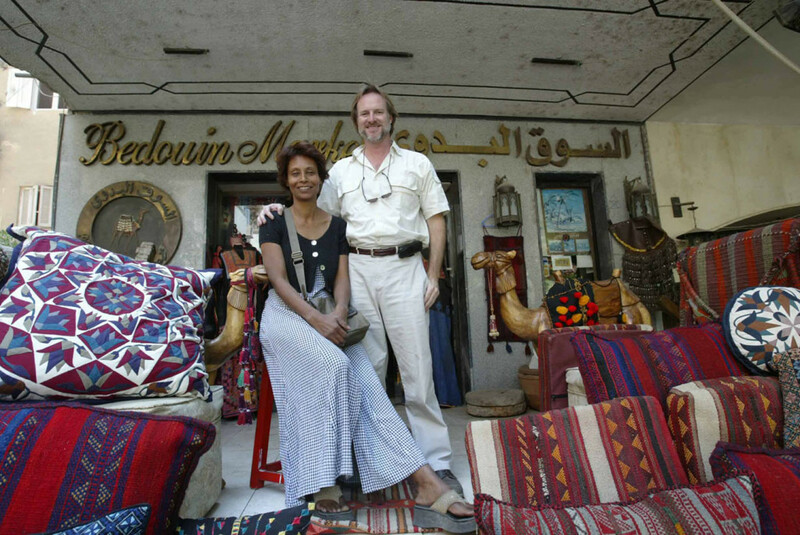 I’m married to a beautiful and clever Nubian-Egyptian woman, Mona, whom I met in Cairo while trying to learn Arabic. She was my teacher. Suffice it to say, though I ended marrying the teacher (and she’s a great teacher), I was too enamored with her to pay much attention to the lessons. We have two wonderful kids, Shams and Nabra. Both are grown and mixing it up in the world. A stable and secure home life is important especially in the world of wire service photography. At any moment you may be called away to cover a story in a far flung place. It can be dangerous and uncomfortable and is almost always tiring and stressful. So coming back to a nice and comfortable place is essential. I now live in Topanga, California. A mountain community sandwiched between Malibu and the San Fernando Valley. Beautiful place. Almost more important than anything else. I have been blessed with pretty good health considering many of the generally unhealthy places I have traveled to and some questionable food and water I have consumed (out of necessity). Malaria, cerebral menigistis, tsetse fly, cholera, plague, dysentery, yellow fever, bilharzia and a host of other maladies are unfortunately endemic in much of Africa where I traveled (Sudan, Uganda, Ethiopia, Somalia, Chad, Madagascar, Ivory Coast, Senegal and many other places). I try and eat well. Don’t do much exercise which I should. I try and not get too stressed out over things especially not work. There are just too many factors in photojournalism that you can’t do much about and getting frustrated is understandable but getting angry and pissed off doesn’t help your well being. It’s a hard balance to know when to push a situation by getting annoyed and confrontational (sometimes you just can’t accept no) and letting it slide and being more accommodating. Dealing with those situations have been the most tiring for me and even after more than 30 years doing this job, it’s hard to know when you need to be loud and pushy and when to be calm and conciliatory. Always important to enjoy the work you do. I have been a wire service photographer for almost all of my professional career. 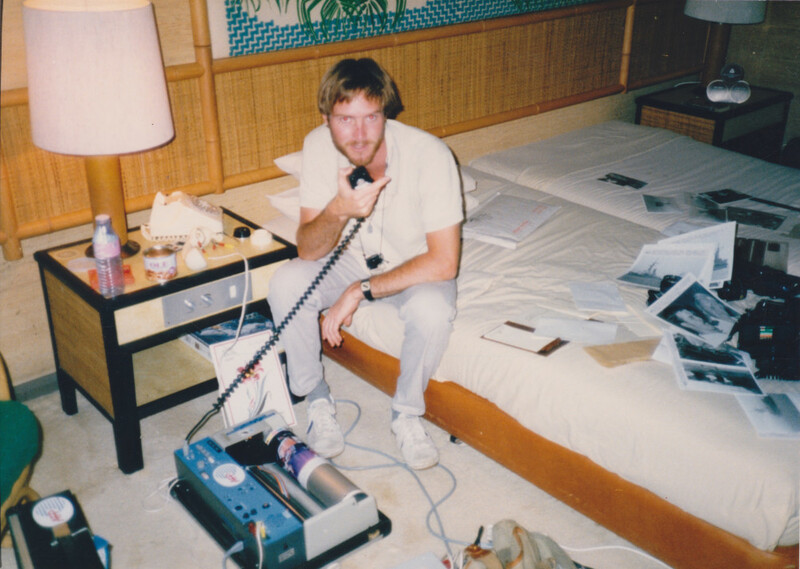 Transmitting pictures from the hotel following the Iraqi missile attack on the USS Stark destroyer which killed 37 sailors in 1987. If you are not familiar with the term ‘wire service” it refers to news agencies such as the European Pressphoto Agency (which I work with now) and others like Associated Press, Agency France Presse (worked with them for 16 years) and Reuters. It use to be that photographers working for these international news agencies had to ‘wire’ their images by the use of telephone lines. We would develop negatives (sometimes in hotel rooms, or locker rooms), print pictures (we had to lug around enlargers, trays, chemicals), type out a caption (we carried a typewriter with us as well), adhere the captioned print to a drum transmitter, connect the transmitter to a telephone line usually with alligator clips after taking apart the phone, dial up the headquarters office, and while talking through the machine, test the line to make sure it is a level and strong signal and calibrate the white signal to the tape recorder at the editing office end and then start the transmitter and hope that after seven or so minutes of the picture spinning round and round and translating the differing degrees of white to black into sounds that nothing interrupts the line causing glitches and breaks in the pictures. 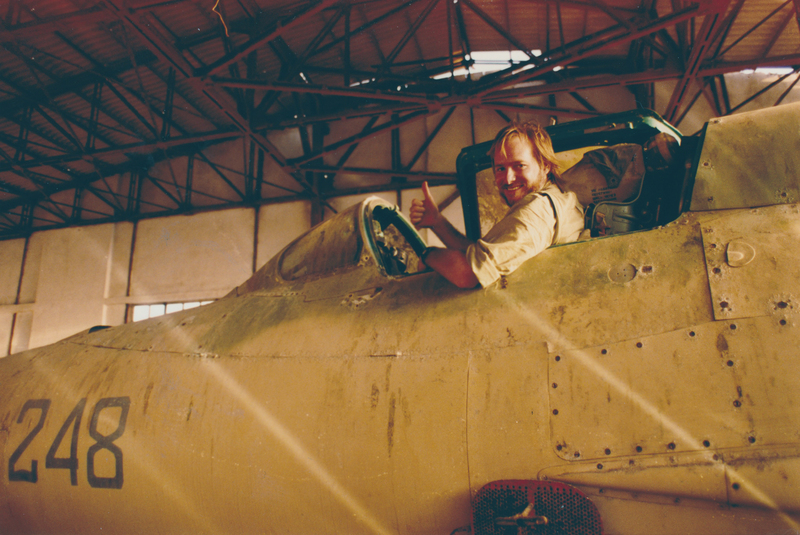 Somali MIG fighter at Mogadishu’s bombed airport. In the US where telephone lines are pretty good interruptions were not too commonplace. However, overseas particularly in Third World nations and ones with ever present state security, somebody using the phone and not talking while it made weird noises was very suspicious and often the line would be cut and a security agent from the hotel dispatched to the room to see what’s going on. On a good day, after a couple of hours of work you were lucky to get three pictures out. Now it’s a completely different story. We file dozens and dozens of images in the same amount of time that it took to send three. Talking with PLO Chairman Yasser Arafat in Algiers where the Palestinian National Council declared Palestinian independence in 1988. Wire service photography has suited me. I like experiencing the world and life and interacting with people. With ‘The Wires’ you are covering stories for newspapers around the world. You get in, get the pictures and when the story moves on to something else you get out. It can be very intense especially if you are covering a breaking news story in some remote corner of the world. The sooner you get there and the sooner you get your pictures out the better chance you have of getting them published. Dealing with visas, customs, languages, transportation, security, lodging, accreditation, let alone getting access to where the story is can be very difficult and challenging. Law enforcement and the military are not friends of the photojournalist. We are looked at with suspicion and animosity. We are, more often than not, regarded as the enemy and because we are generally on our own (not a 3-5 person television crew with their fixers and drivers) and are very identifiable with cameras slung over our shoulders we are easy pickings. It has become increasingly frustrating and, unfortunately, dangerous in the last 20 years. Photographers are easy target. Many of my colleagues have been intentionally targeted and killed. The other thing I have enjoyed about wire service photography is its variety. I’m now based in Los Angeles and here I cover news (school shootings, disasters, what we call breaking or spot news), politics (political campaigns, elections, debates, conventions), entertainment (awards shows such as the Oscars, premieres, star ceremonies, fashion shows), sports (football, soccer, baseball, tennis, skiing, track & field, golf, boxing, Super Bowls, Olympics, World Series), features (sometimes they are weather features, or a festival or something scientific) and, of course, photo stories (the pilgrimage to Mecca, safari to Kenya, killing fields of the Luwero Triangle in Uganda, food aid to Ethiopia, Cuba travelogue, the Mormon Trail). 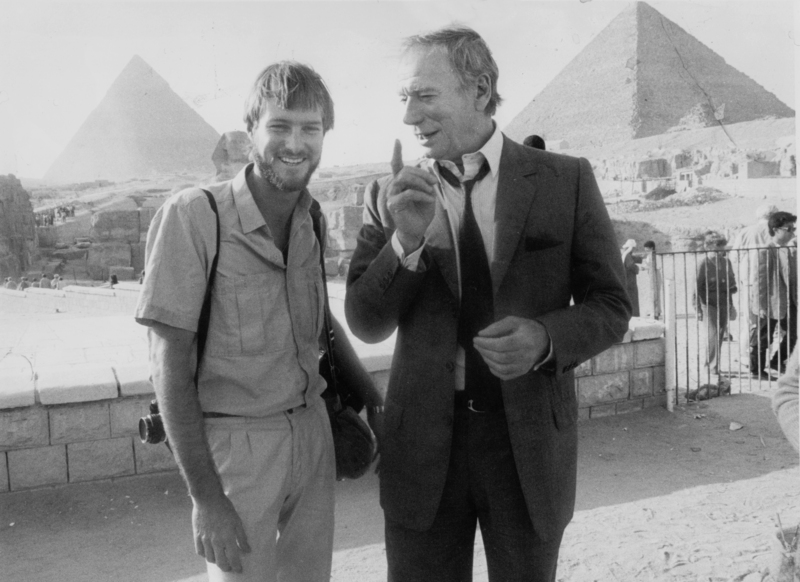 With French actor Yves Montand in Cairo. 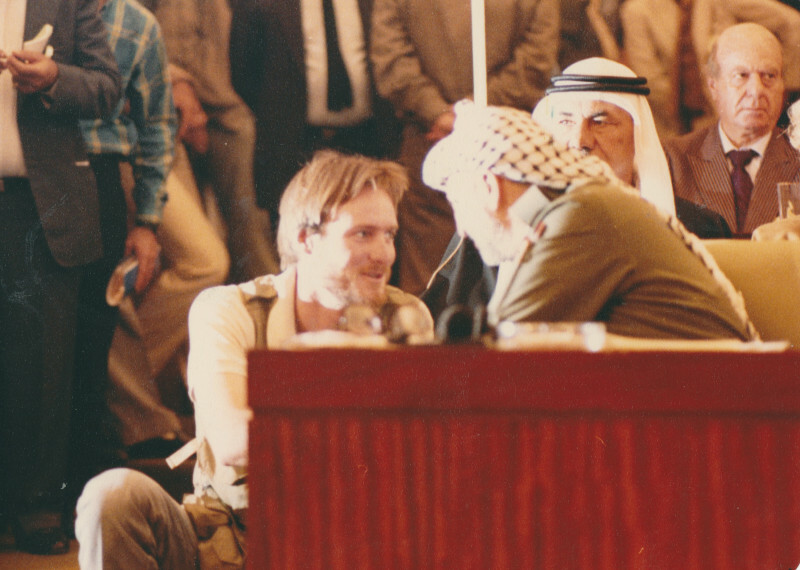 I spent five days with him as he toured Egypt in 1989. Also, what working for the wires has afforded me, is time to experiment with photography as well as do other things. There really is no office I have to go to. I work when there is news or an assignment. Sometimes days will go by where I don’t take a picture. In my early career, I did a lot of darkroom experimentation (cross processing, sandwiching negatives, positive and negative reversals). I do art photography. I have done many collages which I have termed collagraphy (you take a lot of images of a subject and then stick them together). I started it 20 years ago and still do one collage every so often. I used to cut up pictures and make three dimensional photographs. I’ve experimented with macro photography (not so easy but results can be very intriguing….it’s amazing what you really can’t see with the naked eye but when photographed and blown-up is captivating). There are draw backs to wire service work. You are always on call (except generally when you are on vacation). You may get a call in the middle of the night because a plane has crashed, or a wildfire has spread out of control, or a bomb has blown up someplace). If you have to travel you don’t know how long you will be gone for. You have to drop everything at home. If you want to take classes and learn something new, forget it. I tried it (including learning Arabic) and I always had to break the course and go and cover something. Kids’ school functions are missed. Birthday and sometimes even births are missed. Responsibilities for running the home and finances often need to be taken care of by someone else. In my case, it has been Mona and this has put lots of burden on her. Many marriages and relationships have fallen apart because of the unpredictable nature of a wire service photographer’s work. I’ve done well both personally and professionally as a wire service photographer. I’ve covered some amazing and historic stories. I’ve traveled all over the world for my work. I’ve met incredible people; felt profound feelings of joy, sadness; seen and recorded beautiful things and horrible scenes. I’ve been recognized by my peers with honors and awards. I’ve passed on my experiences and knowledge at seminars, lecture and exhibits. And I have a tremendous collection of images that still draw me in and remind me of the life I have lived.